All Things Crafty: Bloggiversary Big Giveaway!! 2 Jelly Rolls and More !! Bloggiversary Big Giveaway!! 2 Jelly Rolls and More !! Hard to believe that I hit the 200 posts milestone. That's a surprise to me. So, in honor of my bloggiversary, I'm having a give away. 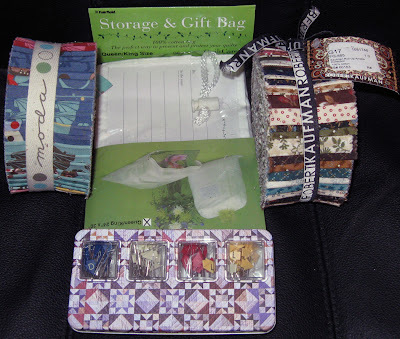 Here's the prize: One Robert Kaufman Amalie Jelly Roll and one Moda Odyssea Jelly Roll and more below. Click photo for larger view. There is also Fon's & Porter's directional pins and a Queen/King Quilt storage bag. It's a great giveaway and pretty easy. Here's how to enter. Leave a comment and a way to get in touch with you (either through your site link or email) and share with me what's your favorite craft item to make (quilts, purses, etc) and earn one entry. One comment per person. Here are the other ways to earn multiple entries. Since I redid my Blog Layout, I found the "followers" application add-in. So I am adding that as of today. If you add yourself as a follower (or reader) you will earn 5 entries. If you blog about the give away, you'll earn 3 entries (but you need to email me and tell me about your blog entry or I probably won't know. Email is on my profile) It's that simple. The deadline to enter is 10 days away. Monday, March 22nd at Midnight EST. The winner will be drawn on Wednesday, March 24th. Contest open to only US and Canada Residents. I look forward to your ideas in your comments. If you have an online link, feel free to share that too! I would love to win this giveaway. Love those jelly rolls and after collecting fabric my favorite thing to do is make quilts. It amazes me to see it all come together. My favorite craft pastime is quilting although I have an extensive collection of cross stitch thread and books. I find sewing/quilting to have more instant gratification. My favorite craft by far is quilting. These jelly rolls would go a long ways towards another quilt or two, too. Thanks for the chance. ps--your blog has a very peaceful feeling to it. i like. Congrats on 200! and you are generous to share! YEAH! My favority is piecing quilt blocks and tops, I have done some machine quilting and hope to get to do more and improve. Of course owning a frame some day would be nice. 200 entries - congratulations! I have fun looking at your blog and would love to win a prize! What a wonderful and generous giveaway!! Whoopee!! My favorite craft is quilting. I am obsessed by it. Collecting the fabric, touching it, etc. And my favorite part of quilting is putting the binding on. By hand. I am so excited about this giveaway. Happy Bloggiversary and thanks for offering such a great giveaway! My fav craftwork is quilting, but on a bright sunny day I still love cross-stitching! Congratulations Trish! I just started blogging myself so 200 sounds BIG! And very nice to meet you, I will certainly be visiting you very often! What a wonderful, generous giveaway! I would have to say my favorite craft of all time is quilting. I love everything about it, fabric, the feel of the quilt when done, and the feeling of accomplishment when complete. I would love to win! My favorite craft is quilting! Every time I see something beautiful, like a neat purse design I have to try it! You have a very cool blog, I love that you like trying tons of different crafts too. Wow! Beautiful fabric and a wonderful gift for quilt making. Congratulations on your successful blog. Congratulations on your Blogaversary! I LOVE to paper piece...wish I could find a 'scenic' quilt in paper piecing. Love your giveaway, hope I win...thanks! My favorite craft is quilting, followed by general sewing. And, I am following you! I am a Trish too! Love your giveaway and your blog. I was reading down a few entries and find myself wanting to read more. I love the piecing and appliquing part of the quilt making - seeing all the pieces coming together to make something totally new. I usually don't follow the patterns to the letter, but tweek them to my liking. Trish thank you for the chance to win. I became a follower.I am looking forward to seeing your lovely creations. I love jelly rolls! I just bought my first one a obut 2 weeks ago. I'm teaching my daughter to quilt. She is 17 years old. So I guess you tell I love to quilt. Wow, great giveaway! My favorite thing to make is definitely quilts. I love how forgiving they are and how impressive they can look with a little effort. Congratulations!! What a fantastic give away! Thanks for the chance! What a wonderful giveaway! I love to do all sorts of crafty things but if I had to choose it would have to be quilting. Wow Trish, amazing. I think I must be close to that. Maybe give away some of my orange fabrics! This would be a great win for me to mix with all the stash stuff. Congrats on your 200! I love making quilts and those Moda fabs look fantastic! Tx for adding me to your contest. I'll be blogging about you too, as well as adding you to my follow list! Great giveaway! I just started blogging; although I have been following you in reader for some time now. I think that I just made it to 10 posts today, and I am still just amazed at the high posters like you with 200!! Way to go Trish!! Thanks for a chance! what a cool giveaway! I'm a quilter, though love scrapbooking & sewing clothes too. Congrats on your 200! Fabulous giveaway... and great blog!!! I just started one myself - won't get to 200 for quite a while! I found your blog through Wendy's site...congratulations on your blogiversary! Thanks for this wonderful giveaway. I love to make bags and purses. I also love to sew little outfits for my kids stuffed animals. I became a follower. I really like your giveaway. Thanks! My favorite past time is knitting. Sewing comes up second. I will be following your blog, too. What a fabulous fun give-away! Please do place my name in the quilting bee ring...I'd dearly love a chance to win such wonderful gifts! Happy Bloggiversary! Love the giveaway, and of course, quilting is the BEST hobby of all time! I follow you all the time and will definitely say you are doing this giveaway although I hate to tell anyone about it. Less chances. My favourite is baby and lap quilts... they're relatively fast and so satisfying (plus make great gifts!). OOps! My favorite thing is to make large bed-sized quilts with lots of different fabrics and fairly intricate blocks. As I mostly hand-piece and hand quilt, I am more process than product oriented. Would Love to win your give aay..
My favorite craft item to make would probably be cards, because they are nice to personalize and can be made pretty quickly.